Butler's Maria Lucas (1) celebrates with teammates after scoring a point against Seneca Valley in the Golden Tornado's 3-2 volleyball victory Tuesday night. BUTLER TWP — Maria Lucas pumped her fists and yelled as her teammates converged and surrounded her. High fives were shared. Bellows rang out. The Butler girls volleyball team feeds on such energy. “We try to get so excited after every point because every point in a match like that is huge,” Lucas said. It certainly was Tuesday night against Seneca Valley in a battle that essentially came down to two points. The Golden Tornado survived a late-match rally from rival Seneca Valley on their home floor to win 23-25, 25-16, 25-18, 21-25, 15-13. Lucas had a big hand in that fifth-set win with three kills, two aces and two blocks. “I told her, 'Put the team on your shoulders,'” said Butler coach Meghan Lucas. Maria Lucas heeded that instruction, finishing with 11 kills, 10 digs and five aces. But she was just one part of a special night for Butler. Freshman Taylor Welter had eight kills. Senior libero Hope Fiorina had 23 digs — most of them big ones. Senior Tabitha Walker added eight kills and senior Sophia Sacriponte pitched in six kills, two blocks and 13 digs. It was the first time the seven Golden Tornado seniors had ever beaten Seneca Valley. And it certainly wasn't easy. “It was a battle, that's for sure,” said Coach Lucas. “I knew Seneca was going to come and battle. I told the girls, 'You cannot let this slip away.' We've been playing well all season, and Seneca — their record does not show what they're capable of. They have a good coach and a good program. Seneca Valley (1-7, 1-5) used an 11-0 run in the first set to build an 18-10 lead and held on for a 1-0 lead. Butler (6-2, 4-2), though, won the next two sets relatively convincingly before momentum shifted again. Sarah White was a big reason why the Raiders climbed back into the match. The sophomore, who was an all-state first-team selection last year, had several kills, blocks and digs in the fourth set and finished in double digits in all three categories. 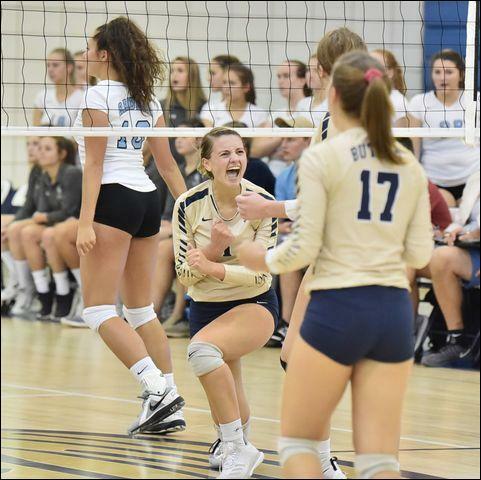 But the Raiders were bitten by unforced errors — 50 of them according to Seneca Valley coach Karen Martini — and had a rough night at the service line with 13 errors. Still, Seneca Valley led 9-8 in the fifth set and were tied with the Golden Tornado at 13-13 before losing the final two points — again on unforced errors. “We are learning to be finishers and we are not there yet,” Martini said. The Raiders played most of the night with two juniors, two sophomores and two freshmen on the court. “We are a young, rebuilding team and we're going through a rebuilding year,” Martini said. The opposite is true for Butler. With seven seniors who have been through the ringer in one of the most difficult sections in the state, Butler has high hopes for this season. “Even though we're not the biggest and we might not look like the strongest team, we just have so much heart and hustle,” Maria Lucas said. Butler's goals have become even loftier midway through the season. “This year we all just decided we are going all out, holding nothing back. Pedal to the metal,” Maria Lucas said.